On Christmas morning my kiddo is knee deep into her vegan stocking chocolate. Getting her to eat anything healthy for breakfast can be quite a challenge. Today I’m going to show you how to get something that is aesthetically pleasing, Christmas-y and might just be different enough that your whole family will give it a try. 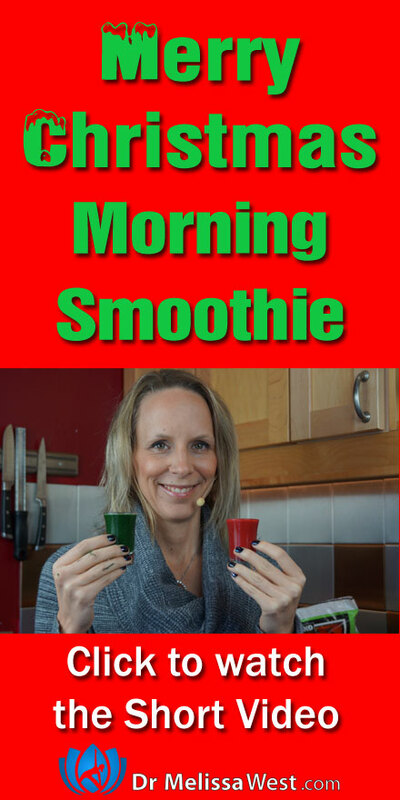 It is packed with loads of nutrients and will give them some vitamins and minerals to get through the day. 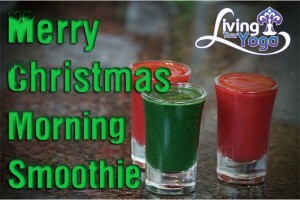 We are going to make a red and green layered smoothie that you can put into special glasses. For even the pickiest eater you can put them into shot glasses and dare them to take it down the hatch. First we will combine raspberries, strawberries, pomegranate juice and acai berry powder for a bright red layer. Acai berry powder has anti-aging effects for your skin, helps overall blood circulation, helps with digestion, fights against cancer, gives an energy boost, improves cellular function, improves mental function and helps to keep your heart healthy. For those watching your waistline this holiday season, acai berries help to curb your appetite therefore aiding in weight loss. Secondly, we will combine frozen kiwi, greens (I’m using collards today) and spirulina to make a festive green layer. Spirulina is 65% protein, which means it will give you three times as much protein as beef or cow’s meat by weight. Spirulina’s high chlorophyll content makes it an excellent detoxifier which is great during the holiday season when so many of us are indulging a little more. Spirulina has loads of iron that is easily assimilated by your body. Spirulina is high in omega 3 fatty acids such as GLA which have powerful anti-inflammatory effects on your body. Spirulina contains vitamins A, D, C, E, and B vitamins. Spirulina has 4xs the antioxidant power of blueberries.